Perfect replacement for our Malika that was just getting too old and faded, appearing more sage and yellow. This is a true blue gray and looks just like the photo. Perfect! 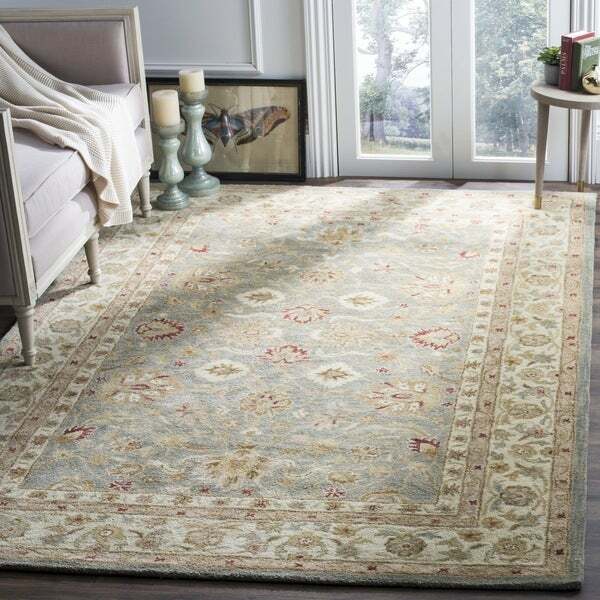 Safavieh Handmade Antiquity Blue-grey/ Beige Wool Rug - 9'6" x 13'6"
Safavieh's Antiquity Collection features rugs that are hand-tufted in India of 100-percent hand-spun premium wool for long-wearing beauty and performance. The elegant design and colors of this rug are inspired by 19th century antique Persian rugs, and employ ancient pot-dying techniques with a special herbal wash that gives this rug its luster and aged patina. A range of colors from beige, grey, yellow, and blue with accents of red in some of the floral detailing encompass this rug. These shades are expertly woven to create an organic color scheme to complement any existing home decor and ensure that from season to season, this rug will never go out of style. Its traditional motif makes this carpet an ideal choice as an elegant living room piece or a comforting bedroom rug. Choose to make a visual impression with this standout piece from Safavieh's Antiquity Collection. Beautiful rug, just as expected. 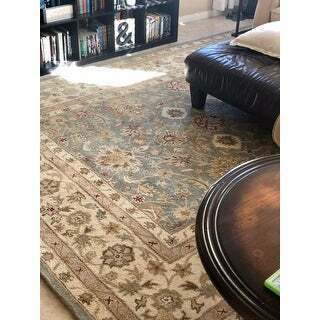 I looked at this rug online for months, here and other sites comparing prices and pictures. Some reviews said the colors were very different than pictures online. I was hesitant but when it finally reached a price I could not pass up, I went for it. The rug arrived quickly and is just as it appeared online. The background is ivory. I don't see it as yellow at all. The border and middle are definitely a light blue rather than mossy green as some mentioned. The red flecks are a brick/maroon color. My walls are "peppery" (an orange-red) and it works just fine. The measurements are true and it is a lovely rug. I have only had it down for a few weeks, but haven't noticed any shedding at all. It is under a dining table so it doesn't get a lot of traffic. I wanted to take a photo but pictures from my phone look dark and I didn't want to post a picture that appears different than when I am looking at it in my home. This rug is also very soft to walk on. I only purchased the thin rug pad because I didn't want the rug too thick, which was a good call considering how plush it actually is. Nice rug. Color is as shown. Beautiful Rug, Affordable Price...Great Value! Very nice rug...the colors and design shown are very true to the actual rug (perhaps even better in person!) The rug does shed a bit, but we have only has it for a couple weeks, and I anicipate the shedding to decrease over time. This is a very good value...great price, good quality...! Would definitely recommend to a friend or buy another similar quality rug for a different room. We bought the 9'x12' rug...it weighs over 100 pounds...a substantial piece for great price. My rug just arrived. It is absolutely beautiful. It exceeded my expectations. The colors are muted, yet still so pretty. There are lots of different undertones in this rug: cream, beige, greens, light blue. The pretty burgundy makes it pop a little. Quality is amazing. I had read a lot of reviews before ordering this rug. Overall - I'm pleased with the quality of the rug especially for the price. 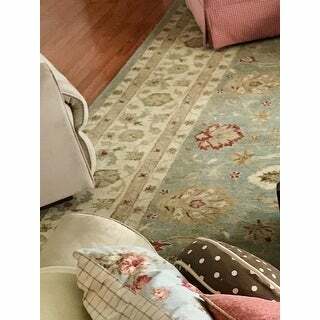 As others have said, the rug colors are not exact but close to online pics. It is a very light colored rug. Very thick pile. It does not look like a multi thousand dollar fine rug but for the price I don't think you could beat it. I'm certain it would cost lots more if purchased locally. The rug is very beautiful and feels like a nice wool rug should feel and look like. The colors are mostly soft but the burgundy- red on the large leaves in the center pattern stand out. I would recommend this rug if it's the only one going in a room. But trying to match it is difficult. This rug is exactly what I was looking for in terms of color, thickness and quality. The colors are exactly as shown online. It’s thicker than my old pottery barn rug so my kids love it!! Definitely recommend if the color scheme works for the shopper! Love this wool rug. Very durable and nice colors. Just like shown. Yes I would recommend it to a friend. This rug is beautiful. The colors depicted are quite close to the actual rug. It is really nice quality and a bit plush! I am most pleased! Cannot beat it for the price! Love this rug, beautiful grey-blue color, great quality. I bought a matching runner for my adjoining bathroom. This is a beautiful area rug! The photos are very accurate in regard to the colors. It arrived on time, and packaged very well. Additionally, it rolled out completely flat. It didn't require additional time to "lay flat." The only reason I've given it 4 stars instead of 5 is that it sheds quite a lot. I've vacuumed it several times, and I'm still getting a lot of fiber. Be sure to use a new vacuum bag on the first couple of vacuums, as it will fill up! I would also be sure to use a good vacuum, as a lesser quality one may not be able to handle the amount of wool fiber that will come up. I really hope the shedding stops soon, because I love the rug! Update (1/18/18): This rug continues to shed profusely. I have to vacuum it every couple of days, and it still sheds, especially if kids have been sitting on it to play. Clothes are covered with fibers, and it causes a lot of fiber/dust in the room. It's a shame, because it's very pretty, but it's starting to frustrate me. Update: 3 months later: I'm downgrading the rating on this rug. It's still pretty, but it's become the bane of my existence. It is vacuumed almost daily but still sheds ridiculously, and the wool fibers get into your clothes if you sit on the rug, and then you itch! I'm very disappointed. Pulls the room together beautifully!! Arrived in 2 days!! I absolutely love this rug. The colors are very soft. It is quite thick and has not shed much at all. I get so many compliments on it. I don't have a pad under it, but it's still as soft as if it did have a pad. Beautiful! This is exactly what I wanted! This rug is comfortable to walk on . It does fuzz up some. It's not in a high traffic area so I'm not sure how it will do when I put it in another room. It laid down nicely ; no wrinkles or kinks . I'm very pleased with my purchase so far . Rug arrived in 2 days wrapped well. The colors are muted and will go with any decor. We put this in our master bedroom. It has a few areas that are higher because of how they had to package for delivery, but I hope the will relax in time. Overstock has never disappointed me and this is at least my 10 th rug I've ordered thru the years. I've had this area rug for over 2 years now, and it still has retained its thickness and softness. Of course the wool still sheds, but it's a small price to pay for the quality and durability. The color has not faded, and it keeps our living room warmer during the cold winter months. I was a little skeptical ordering a rug of this size on line, but it was exactly like the pictures stated and it is simply gorgeous. Would recommend this rug to anyone that is in search of a rug for their living room or bedroom. I was so excited when I received it that I couldn't wait to get into the package to see what it actually looked like with my own eyes. The packaging was superb, and the product was in perfect shape, and no creases in the rug. I would definitely buy this rug again. Love this rug! Put in in our master bedroom and it looks beautiful! This is a high-quality, gorgeous rug! People cannot believe what I paid for it! Love this rug! Looks like colors pictured. Very little shedding so far. This rug is perfect. It is exactly what I wanted. "What is weight? What is pile weight per square inch? Is manufacturer name on back of rug? How high(thick) is it? Is it 100% wool?" This weighs 108lbs and has a pile height of 0.50 inches. The rug has a wool pile and a cotton backing. My mother saw it online! "Hi does this come in a sample size. What if the color is not as pictured and need to return, how much is return." "What is the backing made out of?" This rug has a cotton backing. "What is the actual measurement of the 9 x 12 rug." 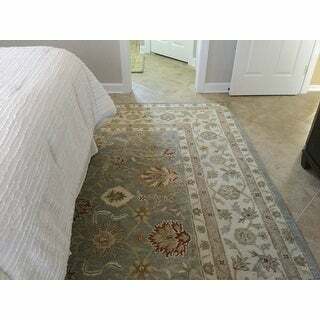 The rug measures approximately 9 x 12.